Tom Peters said: "Sales are where the money comes from! � Training the sales force presents a vast opportunity to any company willing to make the investment of time and money it requires. If a company does not have people with the skills and knowledge essential in selling, it will get left in the dust." Natural Selling Concepts empowers your sales management and every sales person on your staff to make a positive impact on your bottom line. That means more sales easier and faster! Natural Selling Concepts is the result of my 40+ years in sales, learning which techniques work and which do not. Principles have been studied; techniques have been tested and re-tested in the real world with sales people selling real services and products. These proven principles and techniques are the foundation of the high intensity comprehensive Natural Selling Concepts programs that have been attended and verified by thousands of people. It is impossible to guarantee your actual results. So we go one better. 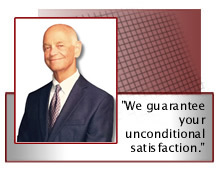 We guarantee your unconditional satisfaction. Anytime, even after our work is done, if you are not totally satisfied with our service, you may ask for and immediately receive a full refund.